We're grateful for all our customers, for a variety of reasons. We are a business and so, naturally, revenue from customers is a good (nay, great!) thing. But our appreciation extends well beyond financial gain. We're in this business to improve healthcare delivery and by extension, the lives of clinicians, staff, and patients. From our customers, we learn valuable lessons every day. These lessons might come in the form of new product ideas and/or product improvements. We also learn about the unique needs of different health systems and clinics--needs that often vary depending on organizational culture, EMR use, and even, geographical location. This knowledge helps us develop software, process, and people so that we can better serve our growing market. And these are just what we know of! Martha Mastroberti, Manager of Healthcare Informatics at Valley Medical Group was kind enough to share her thoughts about being an athenahealth® Showcase client, how her organization finds software resources, and the impact that Swoop for athenaClinicals, has had on their practice. Thank you, Martha and your team, for your time and energy. We're sure other healthcare systems will benefit from your experience! You are an athenahealth showcase customer, what does that mean? athenahealth Showcase clients are encouraged to identify prospects, recruit colleagues, and sell the product through site visits or hosted events. Valley Medical Group doesn't go out and sell, per se. Instead, we focus mostly on hosting prospects at our site visits and talking about the system in an open, collegial way. We talk about “the good, the bad, the ugly” – what works and what doesn’t. Practices were very good to us when we were shopping and we see this as a way to pay it forward. How have you worked with staff to engage them in adopting new products, processes, and change? It depends on the change, really. Some changes are going to happen to staff, whether they like it or not because it's the right thing to do. It’s not a matter of accepting or adopting the change, but managing it so it will be as painless as possible. We focus on communicating in a variety of formats: monthly “brown bag” meetings with the Executive Team for high level announcements, Lunch and Learns, technical trainings, emails, etc. As much as possible, we position change as “good for patients,” since that’s what we’re here for. Or “good for you,” if a change is going to make things simpler. We always try and get to the hearts and minds first, then explain the technical change they’ll see. When working with vendors how do you evaluate and determine the good ones from the bad ones? We rely a lot on references – focusing on like practices. Our worst experiences weren’t because the vendor was bad per se, it just was not a good match for our practice. Size really matters. You should look for solutions that work for similarly sized practices. Our Customer Success team reported that you thought the Swoop implementation was one of the best implementations and "go-lives" you’ve been experienced. What do good versus bad implementations look like? Good implementations are those with no surprises, a clear roadmap of tasks and responsibilities. Also...adequate support for an adequate amount of time. Issues don’t always present the day of go-live and having access to someone who can help you a week, or even a month down the road, definitely makes a difference. Finally, working with vendors who understand our business – not just their technical product – makes it all much easier. The biggest complaint from users are: inadequate time, busywork (usually related to regulatory requirements), and too much change. Swoop has helped with the time issue – for our clerical staff who has historically done the hunting for this data (the data to support refill requests). This means we can push more of the other work their way, which allows clinical staff to be doing clinical work. Variation in workflow is attributed to decreased productivity. Has swoop helped your clinics follow consistent workflows? We worry more about variation resulting in organizational risk than in productivity (productivity is SO hard to measure). We LOVE that Swoop provides clear, consistent protocols for every med, every time. No more judgement by non-clinical staff about clinical care. Keeping patients satisfied is likely something in which we know Valley takes pride. Getting medications in the hands of patients quickly is a crowd pleaser when most Americans rely on daily medications. Was this a reason for looking into a product like Swoop? We definitely hoped it would speed the process, but mostly we wanted to see staff engaged in more productive work. There are more and more prior authorizations coming our way. We were either going to have to hire more staff to manage them or push them to our clinical staff which is, frankly, a waste of their time. Providers like and need to keep their inbox tidy. Has swoop helped with this? Given our workflow (clerical management of information gathering and queueing up meds), this was not a big impact for us. Are you getting less complaints about the “number of clicks” required to fill a medication now that Swoop has been implemented? Do you have plans to continue to expand Swoop to all practices across the enterprise? Yes, one at a time…Endocrinology next. If you would like to set up a time to speak with us or one of our clients about Swoop for athenaClinicals, we'd be happy to arrange this! 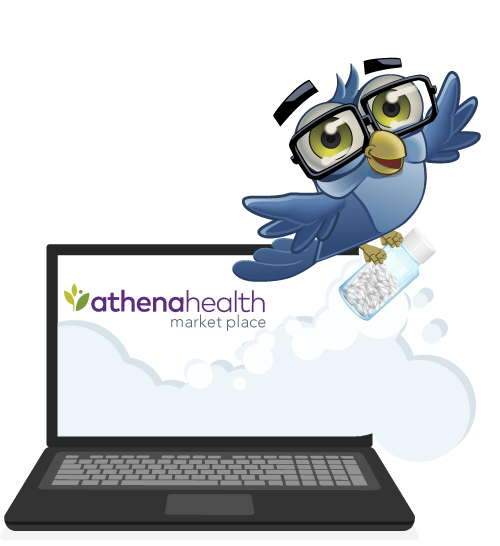 healthfinch is a proud partner of athenahealth. Visit us in the Marketplace!